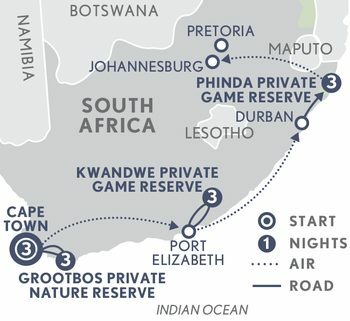 Perfect for the second time traveller or those wanting to veer off the regular safari trail, this journey explores the less visited game reserves along the coast and gives the opportunity to see both the marine and land based wildlife of South Africa. Staying in the very best hotels and safari lodges throughout, you can be sure of an intimate and unparalleled safari experience. Low Season: From $14,780 per person twin share. High Season: From $16,795 per person twin share. Day 1: Arrive Cape Town. An A&K greeting on arrival and assistance to your luxury hotel, One&Only Cape Town, set in the vibrant heart of the Victoria & Alfred waterfront, with exceptional views of Table Mountain. This morning, an ascent by aerial cableway up Cape Town’s iconic Table Mountain (weather permitting) followed by a tour of historic Cape Town including a walk through the Company Gardens, the National Art Gallery, National Library and the Castle of Good Hope. Afternoon at leisure. Venture south for a full day exploration of the beautiful and dramatic Cape Peninsula. Travel along the famous Chapman’s Peak Drive and continue to the Cape of Good Hope Nature Reserve where you can climb the steps or ride a funicular railway to the top. Also visit Boulders, a sheltered beach famous for its colony of the endangered jackass penguin. Day 4: Cape Town – Grootbos Private Nature Reserve. This morning, visit the picturesque and historic town of Stellenbosch for wine tasting before continuing to Grootbos, an eco-paradise nestled within the Cape Floristic Kingdom between mountain and sea at the southern tip of Africa. Days 5–6: Grootbos Private Nature Reserve. Spend two days at award-winning Grootbos, looking out for the ‘Marine Big Five’ (whales, sharks, dolphins, seals and penguins) and enjoying the extraordinary floral diversity. A wide choice of activities includes horse-riding, guided walks, coastal drives, bird watching, as well as land-based whalewatching (seasonal). Day 7: Grootbos Private Nature Reserve – Kwandwe Private Game Reserve. Transfer to Cape Town airport for your flight to Port Elizabeth where you are met and transferred to Kwandwe, a beautiful and vast wilderness area. Days 8–9: Kwandwe Private Game Reserve. Spend two days at Kwandwe with a wide range of activities on offer including twice-daily game drives, nature walks and big game tracking on foot with armed ranger and tracker team (subject to availability). Day 10: Kwandwe Private Nature Reserve – Durban. Transfer to Port Elizabeth for the flight northeast to Durban where a private vehicle will transfer to your hotel overlooking the Indian Ocean. Day 11: Durban – Phinda Private Game Reserve. This morning transfer from Durban by private vehicle (approx. 3 hrs.) to andBeyond Phinda Vlei Lodge in the Phinda Private Game Reserve. This tranquil oasis in the middle of a flourishing wilderness comprises six thatched suites, each with private pool and secluded deck. Days 12–13: Phinda Private Game Reserve. The next two days are yours to explore. Thanks to its coastal rainfall pattern, Phinda has a lush, green ecosystem rich in fauna and flora, and is host to an amazing range of birdlife. Set on a 56,800 acre private game reserve, the area is home to cheetah, black rhino and nyala. Lodge activities include game drives, bush walks, Zulu village tours, night turtle drives (seasonal) and boat cruises. Also available at an additional charge are scuba diving and scenic flights over the area. Day 14: Phinda – Johannesburg. A final game drive this morning before a flight to Johannesburg.